The original Star Trek didn’t shoot for “epic space battle” too often, and not just because the show, at its best, is about not fighting. Star Trek never had much budget to begin with, and the purse got tighter and tighter each season. As a result, space combat happens very rarely, and the audience frequently doesn’t even get to see the action occur—just the same footage of the Enterprise firing torpedoes and some explosions on the viewscreen. So, an episode in which a giant planet-eating machine goes up against not one but two Federation starships is a very big deal, and a very ambitious undertaking. 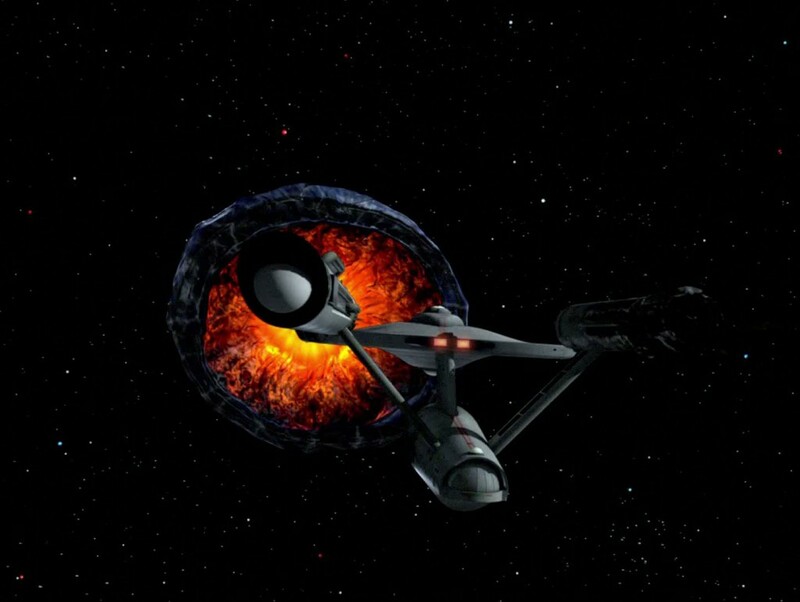 In “The Doomsday Machine,” the Enterprise responds to a distress call from a sister ship, the USS Constellation, and finds her badly damaged, adrift in a debris field that used to be a planetary system. Constellation’s CO, Commodore Decker (William Windham) explains that his ship was in battle with a huge living machine that swallows entire planets. When the machine crippled the Constellation, Decker ordered his crew to abandon ship—only for their refuge to fall victim to the planet killer. Racked with guilt over the loss of his crew, Decker pulls rank and takes command of the Enterprise, plotting a mad, implausible counterattack. Kirk, meanwhile, ends up stuck aboard the derelict Constellation, and must escape before the planet killer can finish her off. “The Doomsday Machine” is a space action-oriented episode, but like any good story, it’s anchored in character conflict. Decker is unhinged in his pursuit of the planet killer, but his heart is in the right place. The machine is poised to cut through a densely populated sector of the galaxy, and billions of lives are at stake. His hesitation, his caution, resulted in hundreds of deaths already. Spock, as usual, serves as the cold voice of reason—one ship failed to stop the machine before, and one ship would fail again. Retreating and calling for reinforcements is the only chance of stopping it, even if it endangers more planets in the meantime. But Decker is damaged, compromised, and in charge. It’s classic military drama, and it ages as well as any other Trek performance. What doesn’t age well are the original special effects. The gravity of the Constellation’s plight is reduced significantly when the once-mighty ship is portrayed by a store-bought model kit that someone scorched with a cigarette lighter. Thankfully, when The Original Series was remastered for high definition in the late 2000s, the space effects—unwatchable in HD—were replaced with CGI reproductions. “The Doomsday Machine” is the episode that benefits from this revision the most, with the CBS restoration team even reinserted some shots from the original script that were impossible to achieve in 1967. However you might feel about tampering with existing published work, the entire Star Trek : Remastered project is worth it for the life it breathes into this one episode. Time travel has remained a welcome Star Trek staple for two reasons: first, because it’s used sparingly and is nearly always treated as a big deal by the characters; and second, because Trek has used time travel in a wide variety of ways to tell new and different stories. “Children of Time” succeeds because of the way it uses time travel to confront characters with a very grave, very personal dilemma. The Defiant encounters an uninhabited planet surrounded by a strange energy field and Dax insists they get in close and make some scans, but the ship ends up caught up in the phenomenon. Moments later, they discover a colony on the surface that wasn’t there when they arrived—a colony made up of the crew’s descendants. The colonists tell them that when the Defiant tries to break orbit, they’ll crash onto the planet two centuries before they arrived and be forced to settle there. The Defiant must repeat the accident, otherwise generations of their offspring will be erased from existence. It’s difficult to discuss the episode more deeply without spoiling the ending (which is less obvious than you might think), but “Children of Time” delivers great character drama while exploring both time travel high concepts and a bit of social science fiction, as the crew learns about the civilization that their descendants have built. 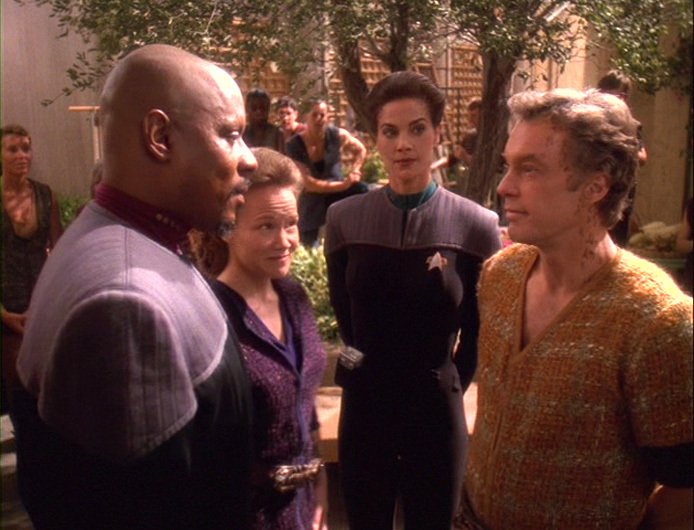 It’s also an important chapter in the development of an ongoing character relationship, and on Deep Space Nine, that means the events of this episode carry some weight as the relationship evolves. Though it may have been a spin-off from a legendary TV show and popular film series, The Next Generation typically shied away from tying in to classic Star Trek characters and stories. They’d done in a few times before—McCoy makes an unnamed cameo in TNG’s pilot, the second episode is an indirect sequel to a TOS story, and Spock’s father Sarek was the subject of an excellent one-off episode in the third season—but as a rule, Original Series characters were not mentioned. After all, TNG takes place nearly a century after the original show ends and the film series was still ongoing, so an effort was made not to spoil the fate of any of the classic crew. By 1991, The Next Generation had become a pop culture phenomenon in its own right, whereas the last appearance of the original crew had been in the disastrous Star Trek V: The Final Frontier, which nearly tanked the franchise. With Star Trek VI: The Undiscovered Country, Kirk and the gang’s last hoorah, about to hit theaters, the film looked like it might actually need a promotional bump from its popular spin-off. So, for the first time ever, an actual Star Trek crossover was devised, one that would have the crew of the Enterprise-D meet up with the most iconic character in the franchise: Spock. When Spock, now a Federation Ambassador, is suspected of defecting to Romulus, Picard’s crew is sent to investigate and, if possible, bring him home. True to The Next Generation, Part One of “Unification” is a complex mystery plot punctuated by strong character beats and even a few jokes, and is an engaging enough story that it’s easy to forgive that Spock himself only appears at the end of the episode to deliver a single line. Part Two, however, is heavy on Spock, as he, Picard, and Data become embroiled in a secret Romulan plot to invade Vulcan. Spock is the star of the second hour, for sure, but his interactions with Picard and Data don’t disappoint. 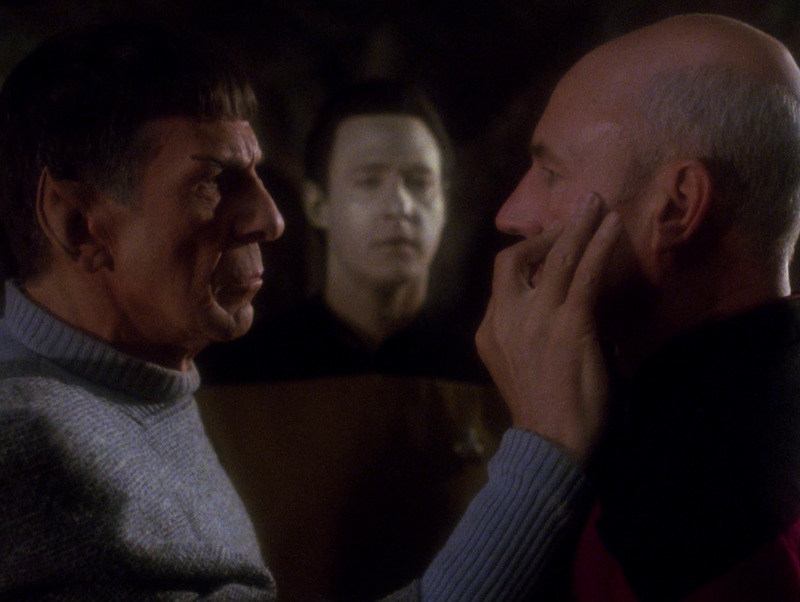 Both TNG stars have a lot in common with Spock—Picard is a thinker, a logical philosopher and a bit of a stoic; Data is superintelligent and doesn’t have feelings as humans understand them—but “Unification” pays equal attention to distinguishing each of them as their own person. While it was devised as a cross-promotion between the two Star Treks, the connection between “Unification” and The Undiscovered Country is so small that if you aren’t looking for it you’d never notice that this was a promotional tie-in at all. There’s a single exchange of dialogue teasing the events and consequences of the upcoming film, and how they influenced his decision to come to Romulus, alone, in secret, but otherwise, this is simply a really good episode of The Next Generation that is also a great Spock story. Leonard Nimoy is magical as always, and Michael Piller writes for Spock as if he’d done so his entire life. It would be eighteen years before Nimoy would appear as Spock again, but if this had been the final canonical appearance of the character, it would have been a worthy sendoff. There are few Star Treks more iconic than “The Trouble with Tribbles,” and that’s kind of funny because it’s a very atypical episode. Rather than facing a galactic-scale threat of a sociopolitical dilemma, Kirk and the gang are tasked with protecting a shipment of grain on remote Space Station K-7. That’s it. And the crew is as puzzled as the audience as to why they’ve been saddled with this bum detail. Kirk suffers the indignity of getting repeatedly lectured by self-important bureaucrats and space station staff, then contending with unruly Klingons, and finally, with the titular menace: Tribbles. Brought aboard K-7 by troublesome merchant Cyrano Jones (Stanley Adams), Tribbles are adorable little furballs who make a pleasant cooing sound and definitely make perfect pets with no drawbacks at all. Oh, except that they’re born pregnant and have twenty offspring a day. Once one Tribble is aboard, their population explodes exponentially, which first becomes a nuisance and eventually an outright plague. William Shatner gets to display comedic chops here, but in a different way from “A Piece of the Action.” That episode is broad, stagy comedy, whereas “The Trouble with Tribbles” is subtle by comparison. For this one hour, Star Trek becomes something of a workplace sitcom, with Kirk cast as a put-upon middle manager who is having just the worst day. 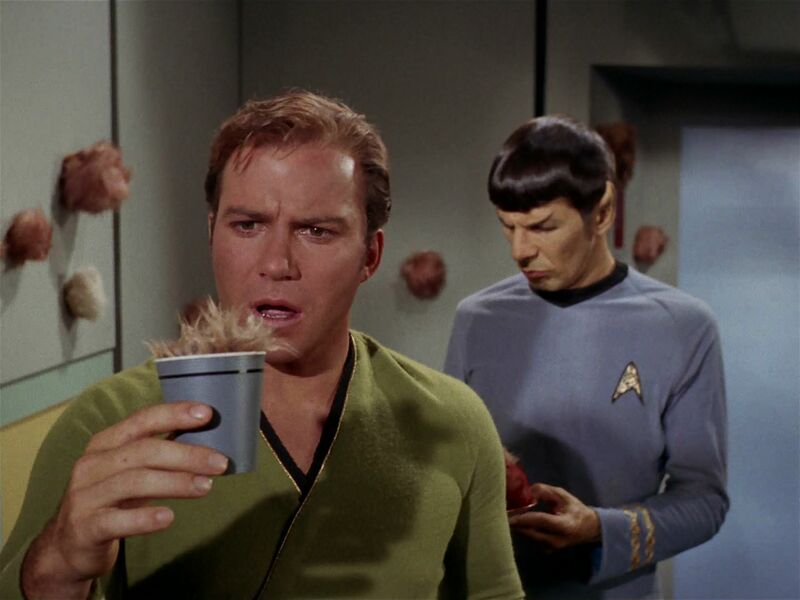 There’s no one major conflict to “The Trouble with Tribbles,” just a handful of minor headaches that pile on one after another to try Kirk’s patience. The rest of the crew each gets their laughs in, as well, particularly Scotty, who lets a Klingon’s repeated insults toward Kirk roll down his back but starts an all-out brawl when he calls his precious Enterprise “garbage.” The closing scene, during which Spock, McCoy, and Scotty repeatedly pass the buck as to which of them is going to tell Kirk what happened to all the Tribbles that had been infesting the ship, has an Abbott & Costello quality to it that is very charming. And “charming” really is the perfect word with which to describe “The Trouble with Tribbles.” It’s not always laugh-out-loud funny, it’s just a really good time, sharp and clever and self-effacing. Much like Star Trek IV: The Voyage Home would do decades later, “The Trouble with Tribbles” connects with casual Trek fans by not putting on any airs. True, it doesn’t ask much of its audience, and Star Trek at its best raises challenging questions, but it’s undeniably really great television. “The Trouble with Tribbles” is a reminder that Star Trek is more than one thing, and that’s part of what makes it great. “Space Seed” introduces Khan, the genetically engineered superman who would return as the villain of the classic Star Trek II: The Wrath of Khan. For this reason alone, this episode is likely to stay in the pop cultural zeitgeist longer than the rest of the Trek canon. But more than just the inspiration for a revered film, “Space Seed” is a top-notch Star Trek story in its own right, representing a little of everything that The Original Series as a whole has to offer. The begins with a mystery built on a sci-fi premise, evolves into a dark romance, culminates in a fist fight, and is peppered with memorable moments for the three lead characters. The Enterprise happens upon a centuries-old Earth vessel, the Botany Bay, carrying 73 humans in suspended animation—and in unbelievable physical shape. The crew awakens their leader, Khan (Ricardo Montalbán), who turns out to be a super-strong, super-intelligent tyrant from the 1990s (the not-so-distant future for the viewing audience). Khan awakens his crew of superior men and women and captures the Enterprise, with the goal of finding a new world to conquer and rule. Along the way, the preternaturally charismatic Khan enlists the aid of ship’s historian Lt. Marla McGivers (Madlyn Rhue), whose fascination with his role in history quickly evolves into full-blown romantic devotion. 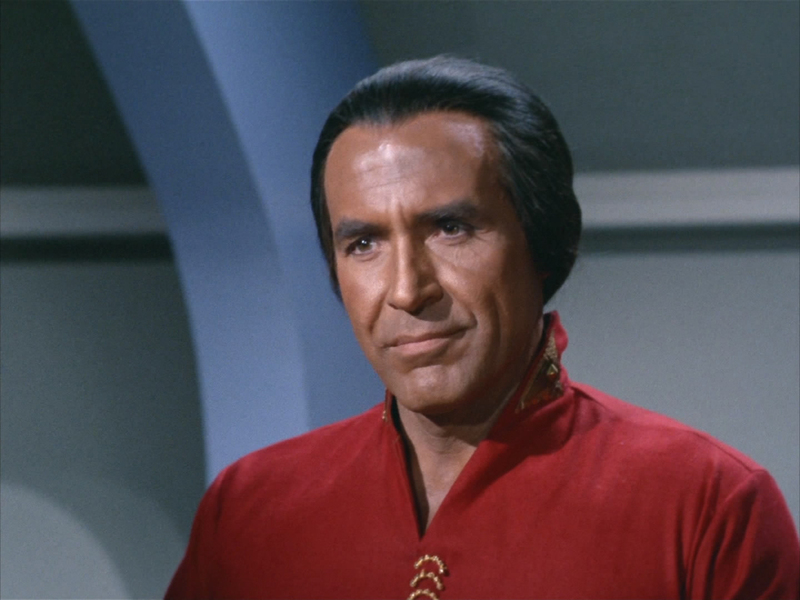 While the gender politics of “Space Seed” are unfortunate (though about par for the course for TOS), Khan’s effortless manipulation of McGivers demonstrates just what makes him so dangerous—not his superior body, but his superior mind. Montalbán, at home in the ham-fisted world of Star Trek, absolutely dominates his every scene without making any of the regular cast look like chumps. Though Kirk eventually bests Khan, Kirk decides to give him the opportunity to do what he was born to do and sets him and his people free on an untamed, uninhabited world. Fifteen years later, Kirk’s mercy will come back to bite him. “Space Seed” works well on its own, but its surprisingly upbeat ending becomes twisted when viewed with the knowledge of what’s to come. And the fact that, for Kirk, this is just another day at the office, is what makes the tragedy of The Wrath of Khan work so well. Further Viewing: Obviously The Wrath of Khan is an essential (and will appear on this countdown), but the three-part Enterprise episode that begins with “Borderland” is a decent story that focuses on another band of genetically engineered Augments cut from the same cloth as Khan, and guest stars TNG’s Brent Spiner as their creator and father figure. #35-30 This Thursday: Not chess, Spock…DIE HARD? !